Papua New Guineans Should Not Allow Themselves To Be Fooled To Believing That The Asia Pacific Economic Cooperation (APEC) Meeting In November This Year Will Transform The Economy Of The Country. 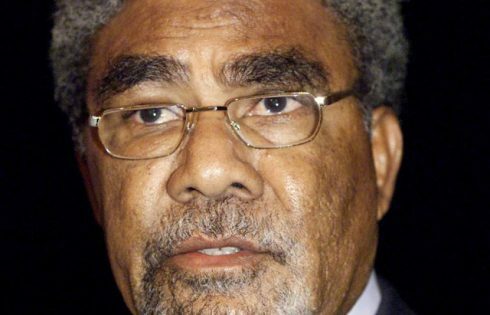 Former Prime Minister and Moresby North-West MP Sir Mekere Morauta has warned people not to fall into believing the Government’s propaganda and hype on APEC to deliver PNG out of its current economic problems and low cash-flow crisis. Sir Mekere said the Government has conveniently converted the on-going APEC officials meetings and two-day leaders’ summit in November into a “cargo cult”. “APEC has wrongly been covered into a notion of cargo cult by the Government to deliberately diverting people’s attention away from more pressing issues and concerns affecting them. “APEC will not solve PNG’s problems such as the rampant corruption, high unemployment, escalating crime, deteriorating state of health centres and hospitals as well as classrooms, roads, telecommunication and transport services. “There is no need to tear down existing good roads in Port Moresby that are in good condition in the pretext APEC preparation,” he stressed. Sir Mekere was speaking last Friday (July 13) during the ground breaking ceremony of European Union (EU) funded K4.5 million infrastructure projects at the Morata Vocational Training Centre (VTC), National Capital District. He thanked the EU for the assistance and noted that PNG needed friendly multinational financial institutions and donors to help recover from the current economic and financial miseries. Sir Mekere assistance should be heavily invested in developing human resources, which is a highly sustainable resources unlike minerals and hydro carbon projects. “Education is a right all every child not a privilege. Education must always be an important pathway for any individual. A nation is as good as it’s educated,” he said. Sir Mekere said when he was prime minister for two short years between 1992-2002 he initiated major political, economic and structural reforms setting the basis of growth and stability PNG enjoys today. The notable changes include those is the limited preferential voting (LPV) electoral system, banking, and superannuation funds as well as introducing the free education policy at the national government level.